As of Monday December 17th, plans are going forward to close the Main Plaza of Tikal to the public from 9:00pm on the 20th until 5:00am on the 21st, although things are evolving and changing every few hours. At Yaxhá the administration had an emergency meeting this morning to discuss what to do if too many people arrive in vehicles. The option is being considered to have people leave there vehicles at the entrance gate several kilometers distant from the main temple site. At Tikal several delegations of officials representing indigenous people’s rights have arrived to protest the shutting down of the Main Plaza to the public on the evening of the 20th. This includes a commission from the United Nations which is concerned with indigenous people’s rights worldwide. The NGO Cultural Survival has also become involved. 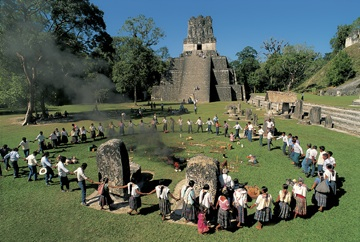 There is a last ditch effort being made to have the schedule changed so that the Main Plaza of Tikal will be accessible to everyone on the evening of the 20th. The clock is ticking and the outcome of the negotiations is uncertain.